Note: This post has been modified. Due to a small change to the equation I used to estimate MiLB home run distances, some numbers have changed. 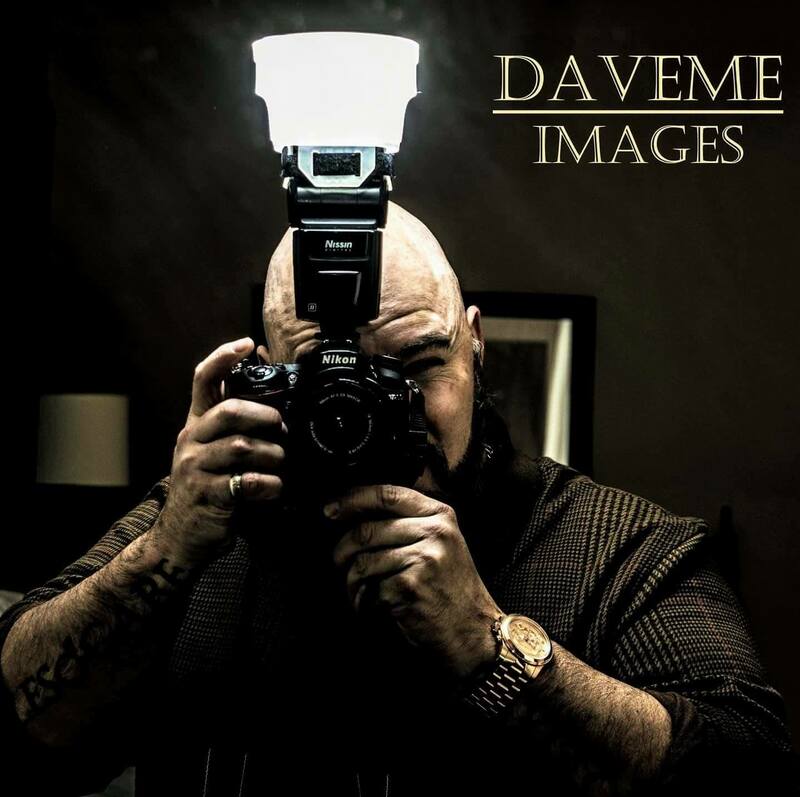 The changes are minor and have not resulted in any meaningful differences from the original post. With the advent of public Statcast data at the MLB level, examining batted ball statistics has become all the rage. Unfortunately, there is very little such data at the MiLB level that’s available to the public. Earlier today, we published a post discussing a method to estimate the distance of home runs hit in the minor leagues. It is our hope that this approach will help fill the MiLB Statcast gap until they start making more batted ball data widely available. 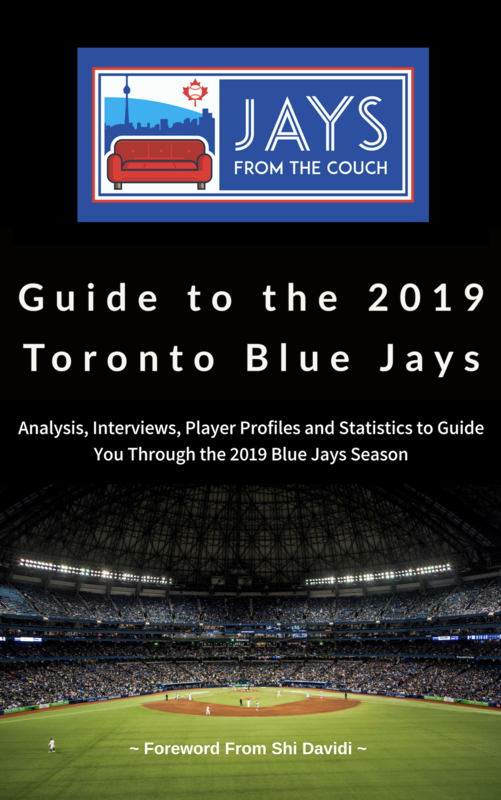 In this post, we will use the resulting data to examine Blue Jays prospects and their ability to hit 400-foot-plus home runs. While somewhat arbitrary, 400 feet is a meaningful threshold in baseball. 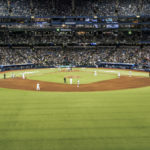 The most common distance to centre field in the MLB is 400 feet (eight parks, including the Rogers Centre). More than half of the parks (19) have a centre field wall that is between 395 and 405 feet from home plate. As a result, a ball that travels at least that far is almost definitely going to be a home run in the majors. In 2018, 2,961 batted balls had a projected distance of 400+ feet, with 2,581 of those leaving the park (87%). As in the majors, not every minor league home run is the same, so having some idea as to which prospects have hit particularly long homers gives us more information about their power potential. In my opinion, that’s the best way to think of this data: more information. It’s a complement, not a substitute. The rate at which a prospect hits 400+ foot home runs highlights something different about their power than other publicly-available MiLB data does. As I mentioned in the companion post, these estimated home run distances are based on “hit coordinates” included in Statcast’s MiLB data. As such, these distances are as accurate as those hit coordinates and should be taken with a grain of salt. However, as far as I can tell, they seem pretty accurate. 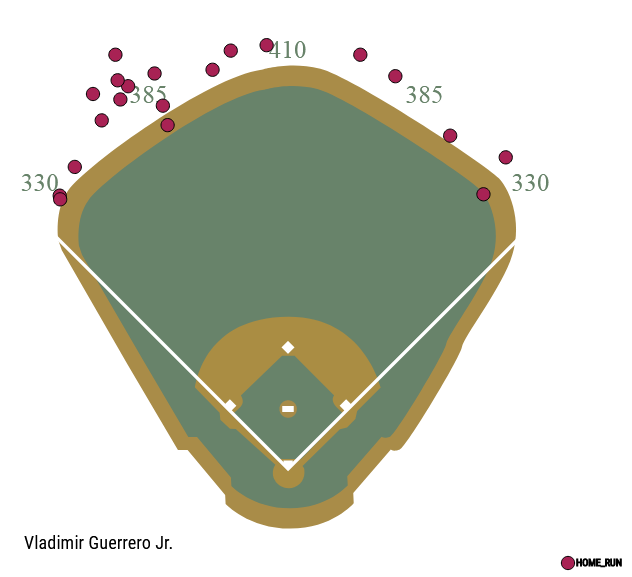 For instance, below is a spray chart of Vladimir Guerrero Jr.’s home runs in 2018, downloaded from the Statcast prospect search. And here is a scatter plot of the hit coordinates of each of those home runs. 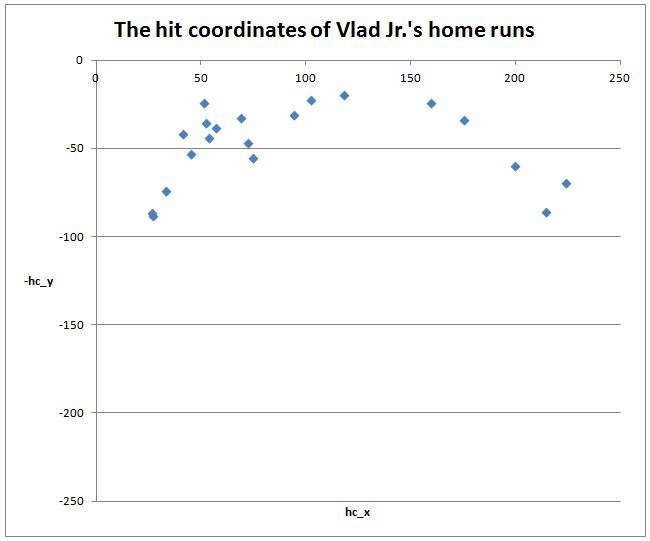 And, finally, here are the points of the scatter plot (the white dots) superimposed over Vlad’s home run spray chart. These hit coordinates are used to produce the spray charts that are widely used by bloggers. If they’re accurate enough for that purpose, they’re accurate enough for this purpose. Let’s start our analysis at the Advanced Rookie level, home to the Bluefield Blue Jays of the Appalachian League. The team’s big bopper in 2018 was Alejandro Kirk, hitter of ten home runs and a personal favourite of mine. Kirk hit two homers past the 400-foot mark, which accounted for 0.8% of his plate appearances at the level. That rate put him in the 60th percentile among batters with at least 100 PA at the level. Hagen Danner, a 2017 second rounder, impressed in an injury-shortened season, producing a 128 wRC+ and hitting a 400+ foot home run of his own (0.7% of his PA). Cal Stevenson, another favourite of mine, showed some pop (.159 ISO) but is more of a line drive guy (as in, one of the top line drive hitters at his level) and finished the season without a long homer. As this short list of home run hitters suggests, the Blue Jays did not hit a lot of long homers at the rookie level. Across all rookie levels, including the Gulf Coast League (where Jordan Groshans hit three 400-foot homers! ), the Arizona Summer League and the Dominican Summer League, the Blue Jays ranked 24th with 16 400-foot homers. Ultimately, it’s not surprising, as the Bluefield team’s best hitters were high BB%/BABIP guys who produced .400+ OBP. After being drafted in the second round of the 2018 Draft, Griffin Conine spent his summer playing with the Vancouver Canadians in the Northwest League (Class A Short Season level). He pummelled the ball, hitting seven homers and producing an ISO (.189) in the top ten percent for his level (min. 100 PA). He hit six 400+ foot homers, accounting for 2.6% of his plate appearances, ranking second at his level in terms of both marks. His plus-power evaluations seem spot on. If he can limit the strikeouts, he can become a very good big league hitter. 19 year old Mc Gregory Contreras was Conine’s partner-in-mashing dingers. He actually out-homered Conine, with eight overall, and out-ISO’d him too, with a .200 mark that ranked in the top seven percent at the level. Two of his homers went past 400 feet, representing 0.9% of his total plate appearances. That was good enough to rank him in the 80th percentile across Short Season A-ball. 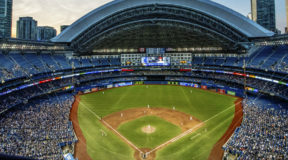 With a number of other players hitting one 400-foot homer, the Blue Jays produced the sixth most long homers across the Class A Short Season level (17). The Class A level was one in which the Jays system had a number of guys capable of making the ball travel. Leading the way were two trade deadline acquisitions that actually spent most (or all) of the season playing for their previous clubs, Chad Spanberger and Demi Orimoloye. Spanberger hit a total of 24 homers at the level, with seven clearing 400 feet (1.7% of his PA, 97th percentile). In his 92 PA cameo at Class A-Advanced, Spanberger hit one 400- footer (out of three home runs overall). Orimoloye only spent half of his 2018 season at the level (245 PA), hitting a total of five home runs, four of which cleared 400 feet. His 1.6% long homer rate was among the level’s best, ranking in the 96th percentile. Clearly, their power is a big reason the Blue Jays acquired them. Blue Jay 2017 draftees Ryan Noda and Brock Lundquist also produced a strong rate of 400+ foot homers. Noda, who spent the whole season playing with the Class A Lansing Lugnuts, hit a total of 20 homers, with six clearing 400 feet (1.1% of his PA). Like Orimoloye, Lundquist spent the first part of 2018 at Class A before a promotion to Class A-Advanced. During his time with the Lansing Lugnuts, Lundquist hit three 400+ foot homers, which accounted for 1.0% of his PA at the level. These power displays put both Noda and Lundquist in the top thirteen percent of Class A batters (min. 200 PA). 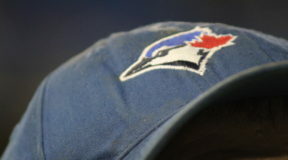 With a number of power bats producing as expected, the Blue Jays tied for the seventh most 400+ foot homers across the Class A level, with 27. While Kevin Smith was limited to only one long homer with the Class A Lugnuts, he managed an impressive six 400-foot homers with the Class A-Advanced Dunedin Blue Jays of the Florida State League. With a long homer in 1.6% of his PA, Smith ranked in the 90th percentile for his level (min. 200 PA). Kacy Clemens and Riley Adams each hit four 400+ footers of their own (1.0% of their respective PA, 75th percentile). Given their below-average ISO marks—.095 for Clemens, .115 for Adams—it seems like some positive power regression is a possibility for both in 2019. 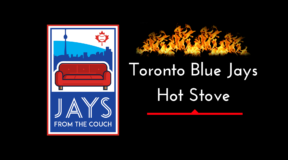 Overall, Blue Jay batters produced the 20th-most long homers at their level (33). Like Bluefield, Dunedin batters were better at getting on base, with the team producing the second best OBP across the level. Double-A was the most fruitful level for the Blue Jays, in terms of big power. Leading the way, obviously, was Vladimir Guerrero Jr. Over his 266 PA at the level, Vlad managed to hit nine homers that travelled 400+ feet, tied for fifth-most. Unsurprisingly, given his low PA total, his 3.4% long homer rate ranked even higher, second only to a 27 year old with MLB experience (Peter O’Brien, 3.5%). 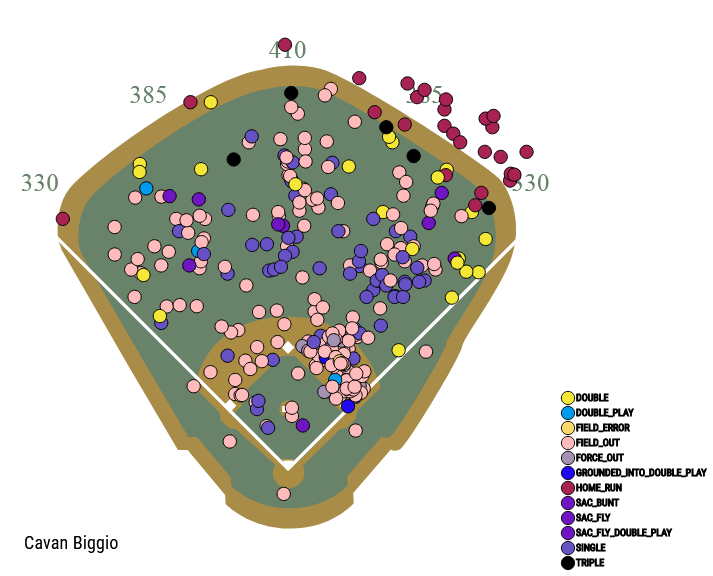 Eastern League MVP Cavan Biggio produced six 400+ foot homers of his own, with his 1.1% rate ranking in the 81st percentile across the level. Given his eye-popping ISO (.247, 96th percentile), six 400+ foot homers might seem disappointing. However, he really is more of a quantity guy, with one of the highest fly ball rates (49.5%) at his level. 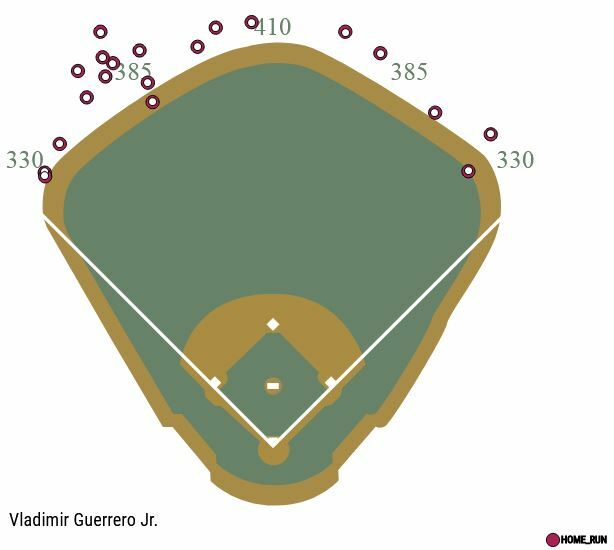 As the image below attests to, while six of his homers cleared 400 feet, plenty more were pulled far enough to clear the right field fence at the cavernous Kaufmann Stadium (the park used for Statcast’s MiLB spray charts). Similarly, the fact that Bo Bichette was limited to four long bombs (0.7%, 62nd percentile) might seem disappointing. On the other hand, of the seven 400+ foot homers hit by a 20 year old at Double-A in 2018, Bo was responsible for more than half. 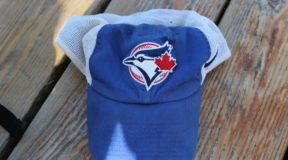 Jays fans have enjoyed his exploits for three seasons and can forget that he is young for his level. Moreover, he’s a guy whose power has come (thus far) mainly via doubles and triples. In a little more than half a season of plate appearances, Juan Kelly and Jonathan Davis each hit three 400+ footers, with their 0.9% long homer rates putting them both in the top thirty percent of Double-A batters. Forrest Wall, acquired as part of the Seung-hwan Oh trade, hit two 400+ footers of his own (0.6%, 60th percentile). Also of note, journeyman Jon Berti‘s dream season (152 wRC+, Eastern League Championship and MLB debut) included an impressive four long homers. With a number of contributors, the Blue Jays produced the fourth-most 400+ foot homers across Double-A (45). These homers helped the Fisher Cats score the most runs across the level. Finally, Triple-A, the last stop before the majors. Leading the way for the Jays is Billy McKinney, another recent acquisition, with seven 400+ foot homers (2.3%, 92nd percentile). After his promotion to the big leagues, McKinney hit another three 400+ footers for the Blue Jays. These represented 2.3% of his major league plate appearances. Like he did at the Double-A level, Jonathan Davis hit 400+ foot homers at an above-average rate with the AAA Bisons. In his half-season at the level, he managed to hit two such bombs, representing 1.0% of his plate appearances (68th percentile). For the 2018 season, half of Davis’ ten homers cleared 400 feet. 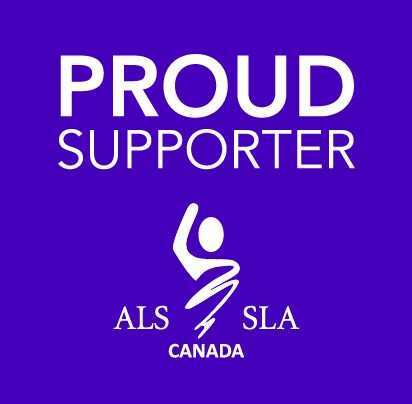 Davis’ brother-in-law, Anthony Alford, is another story altogether. With his plus-raw power and 417 PA at the level in 2018, second only to Tellez, he would have been expected to stand among the team leaders in 400+ foot homers. He hit zero. Rowdy Tellez hit four 400+ footers, good for 0.9% of his plate appearances (64th percentile). He then hit another two after his promotion to Toronto. Danny Jansen wasn’t quite so prodigious with long homers, only hitting one at the Triple-A level (and adding one more in the majors). That said, as long as he keeps hitting doubles and maintaining his solid OBP, the limited number of long bombs won’t be an issue. At the Triple-A level, the Blue Jays produced 31 long homers, the 24th most at the level. With a number of former Fisher Cats expected to start the season in Buffalo, the team is likely to see a lot more 400+ foot homers in 2019. The Blue Jays have a number of power hitters working their way to the big leagues. In 2019, Vlad Jr. (eleven 400-foot-plus homers across all levels) will spend most of his season smacking homers in Toronto. Billy McKinney (seven in the minors, three in the majors) will likely be his teammate, manning one of the outfield corners. And, if Justin Smoak is traded, Rowdy Tellez (four in the minors, two in the majors) might be holding down first. One step away from the majors will be Cavan Biggio (six), Jonathan Davis (five) and Bo Bichette (four). Below them, with AA New Hampshire (or potentially High-A Dunedin), will be Chad Spanberger (eight), Kevin Smith (seven), Demi Orimoloye (five), Riley Adams and Kacy Clemens (four each). Ryan Noda (six) will likely start the season at High-A Dunedin, alongside Chavez Young (two). Finally, at Low-A Lansing, we can expect to see Griffin Conine (six), Jordan Groshans (three), Mc Gregory Contreras (two) and Alejandro Kirk (two). All in all, the Blue Jays system (including prospects and organizational guys) was middle-of-the-pack in terms of hitting homers beyond 400 feet. It produced the 17th most long homers and had the 14th most batters with at least one 400-foot homer. This will be an interesting area of development to keep an eye on in 2019. The front office has appeared to place a premium on power, so I would expect to see the system rise in these rankings in the coming years. PREVIOUS Previous post: Blue Jays’ Brandon Drury: Short term or long term? 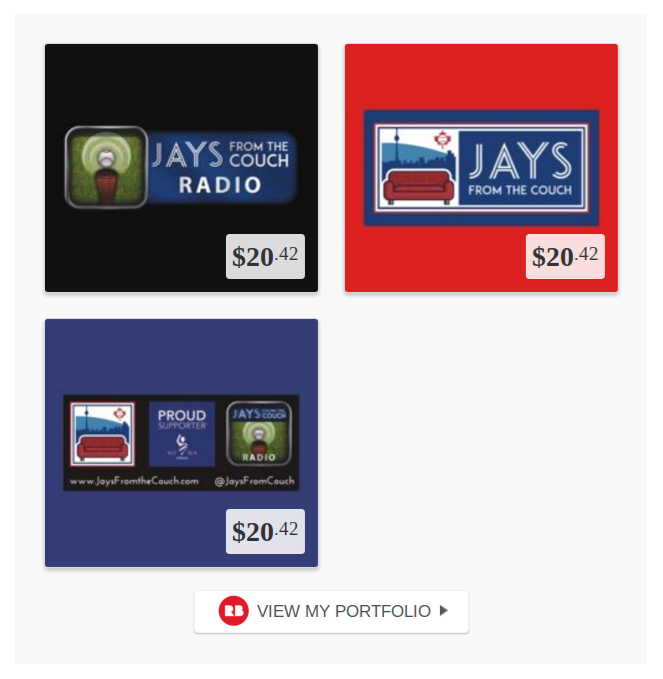 NEXT Next post: JFtC Turns Three! 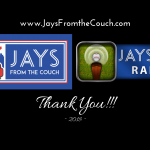 Thank You Blue Jays Fans!